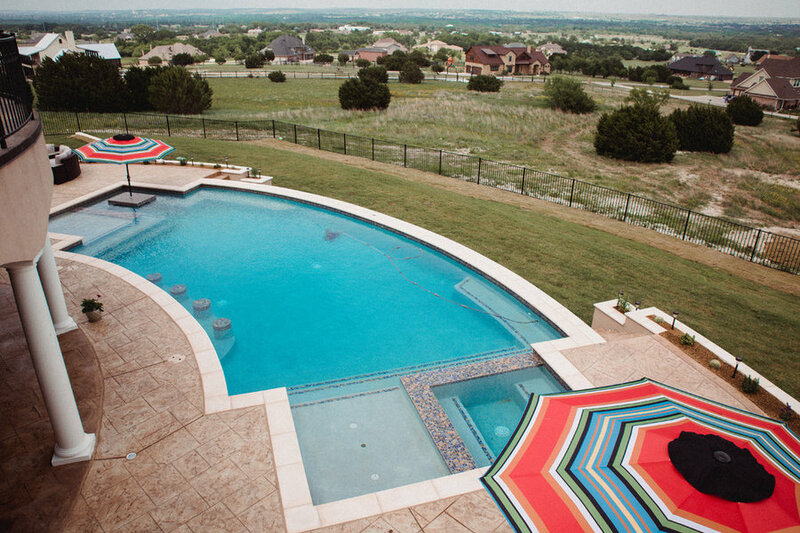 This Texas Hill Country home has a rustic, slightly mediterranean feel. 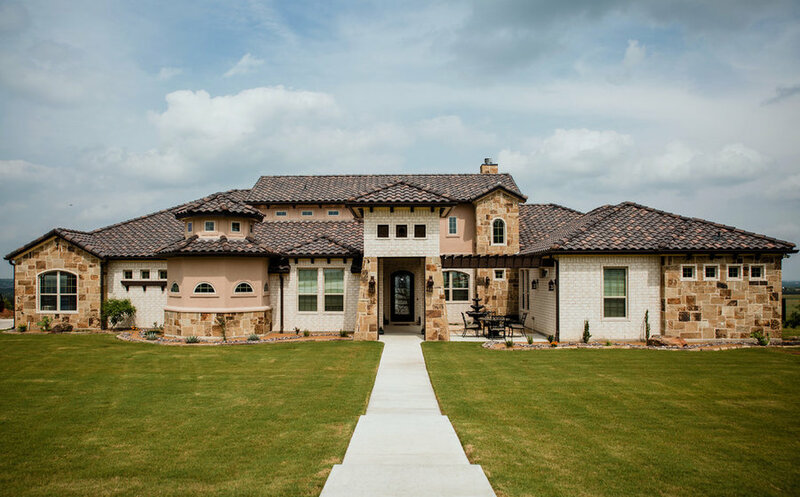 Our clients chose materials and colors which reflect the land around their home, and decided to pursue xeriscaping with native Texas plants. 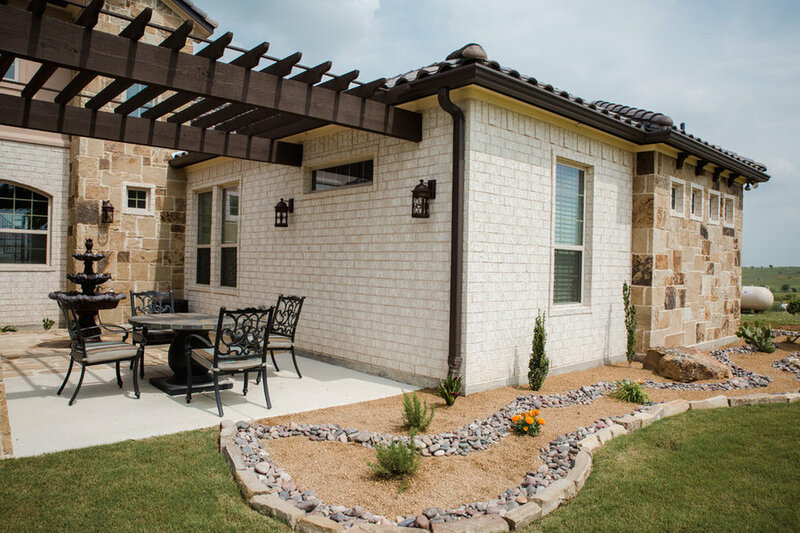 This rustic front entry features a front courtyard space with seating area, pergola, tower, and fountain feature. 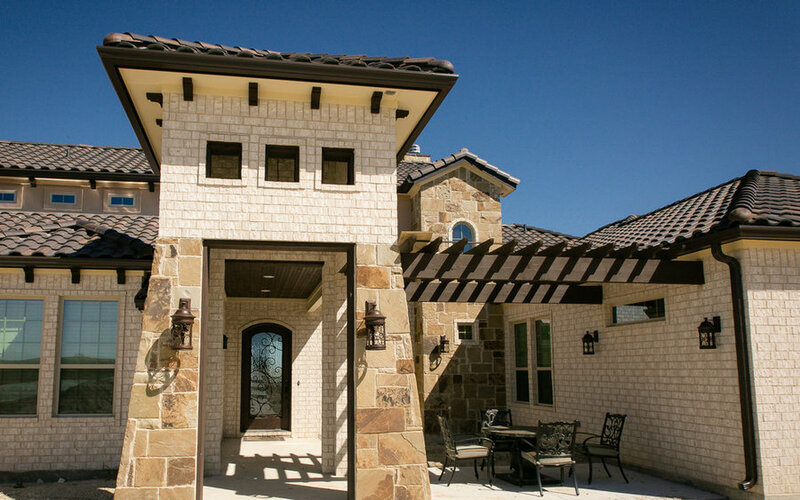 Dark barrel roof tiles and corbels are provide an ideal contrast to the light brick and stone. 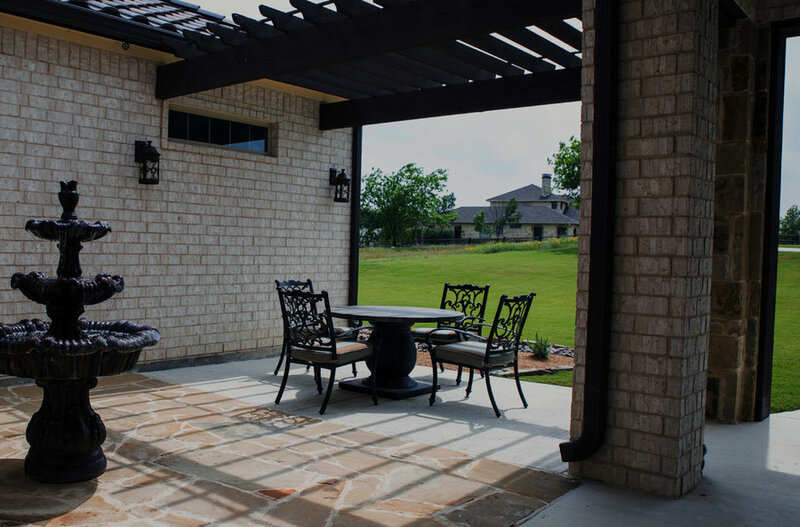 Front courtyard entry with pergola and fountain. Detail of front courtyard seating area. 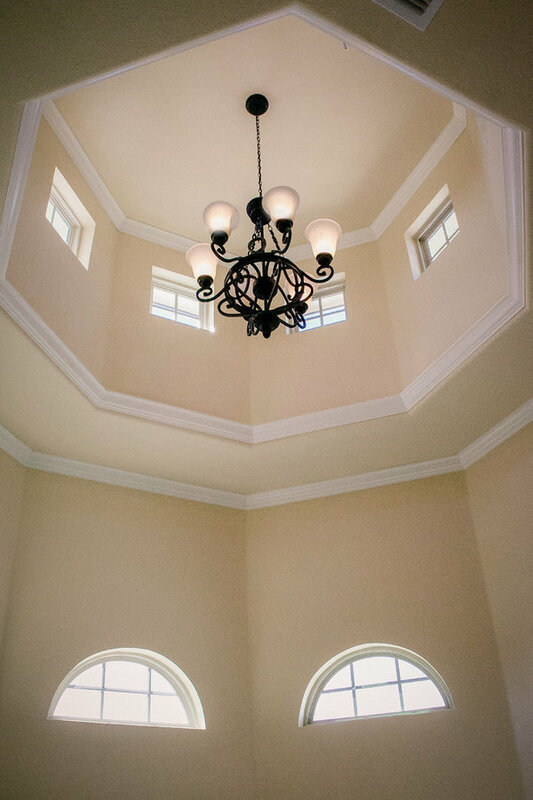 This cupola bring light and an open air feel to our client's exercise room. 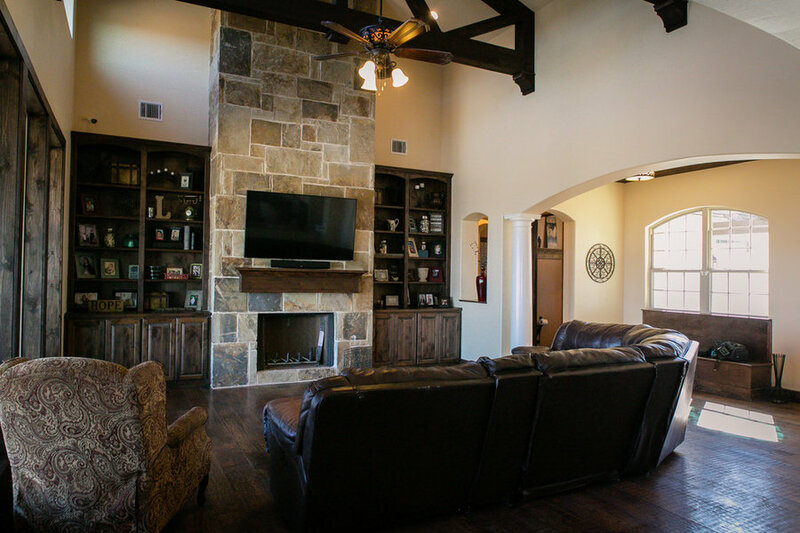 The family room is filled with natural light. 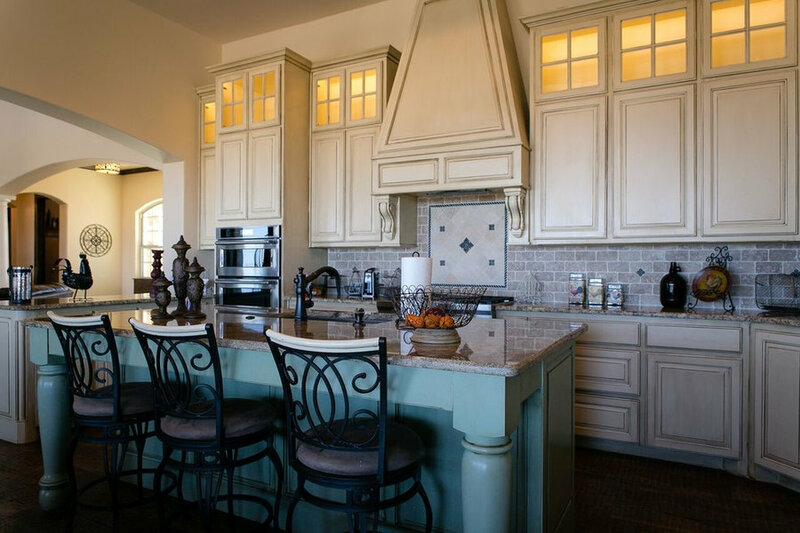 Lighted upper cabinets show off the rich distressed finish. The contrasting island adds a pleasing pop of color to the airy space. View back through kitchen and living area, highlighting the gorgeous interior arches and symmetry Wendy designed. 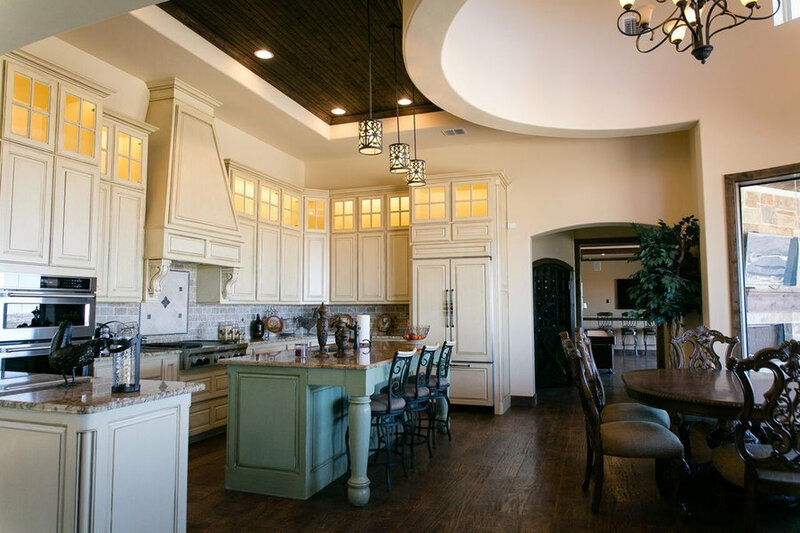 This gorgeous custom kitchen looks out over the domed seating area and out onto the back patio and outdoor entertaining space. 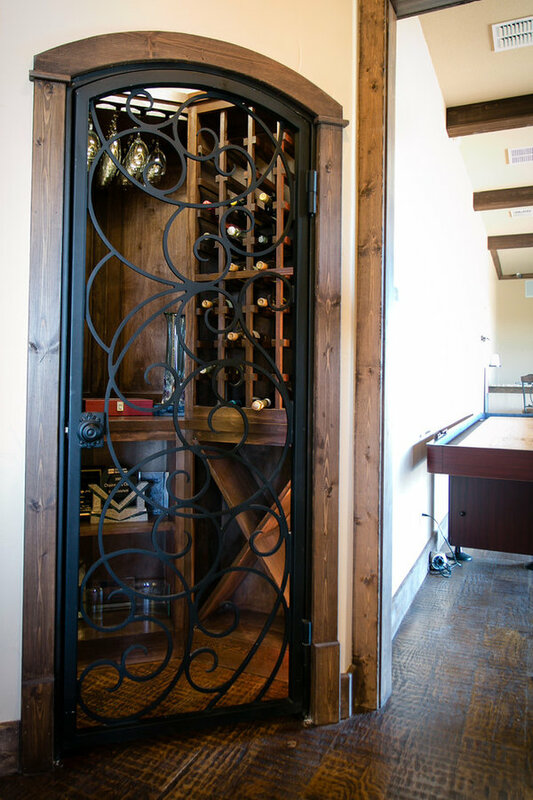 This lovely rustic wine cellar offers great storage and a focal point as you look across through the house. 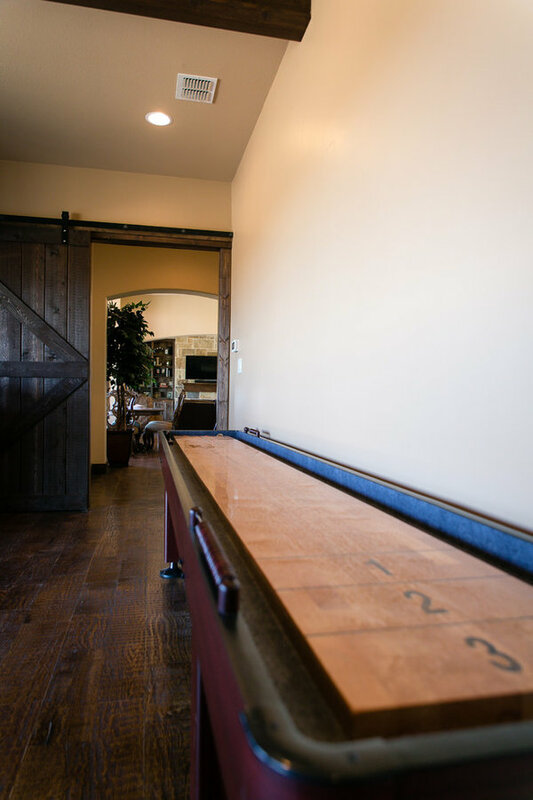 A view of the Game Room entrance, which features a rustic sliding barn door. 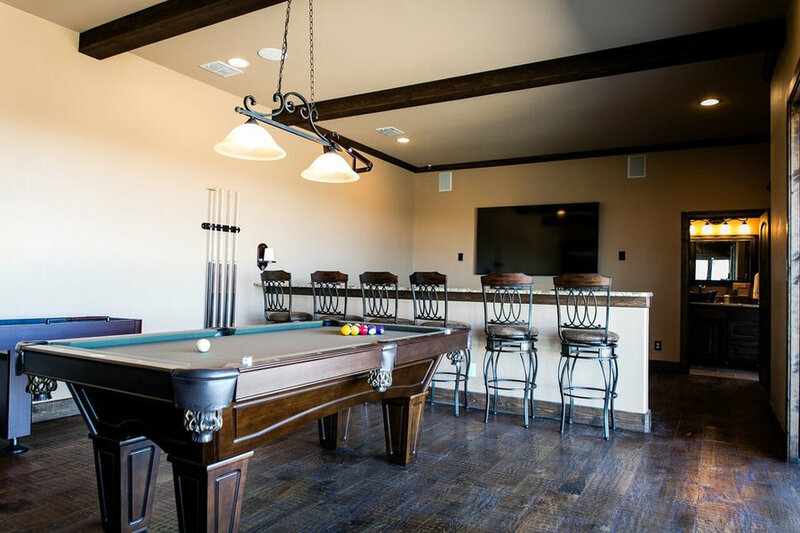 Just off the kitchen, the billiards room serves as another great entertaining space. 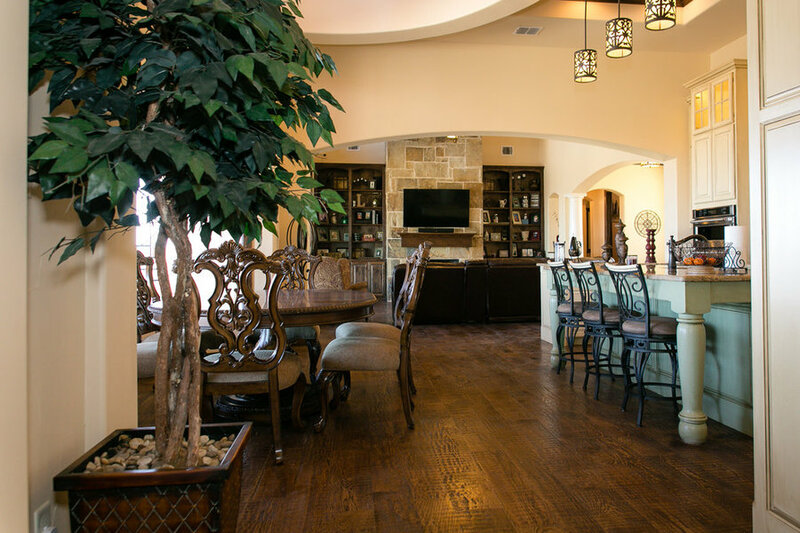 Handscraped wood flooring and dark ceiling beams continue on this home's rustic feel. 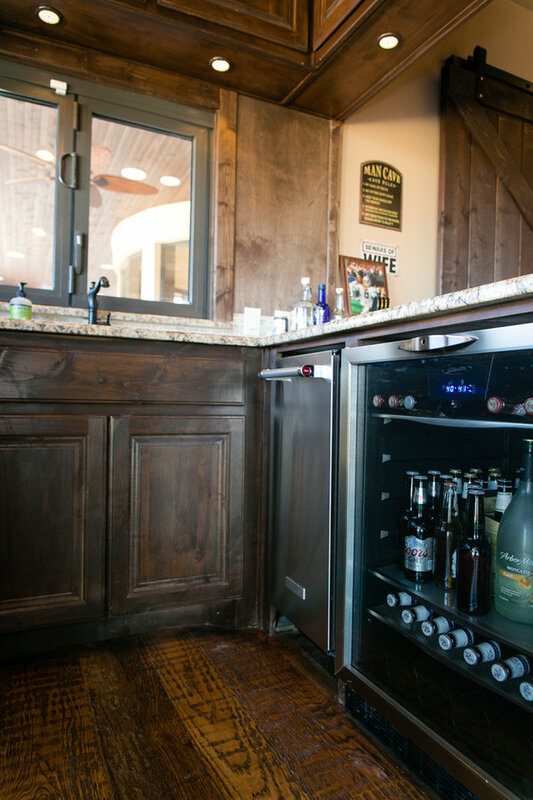 A full bar is tucked on the right, with french doors and pass through windows providing access to the patio and stunning view. A close up shot of the fabulous bar area in the Game Room. The pass through window provides easy access to the outdoor seating area. 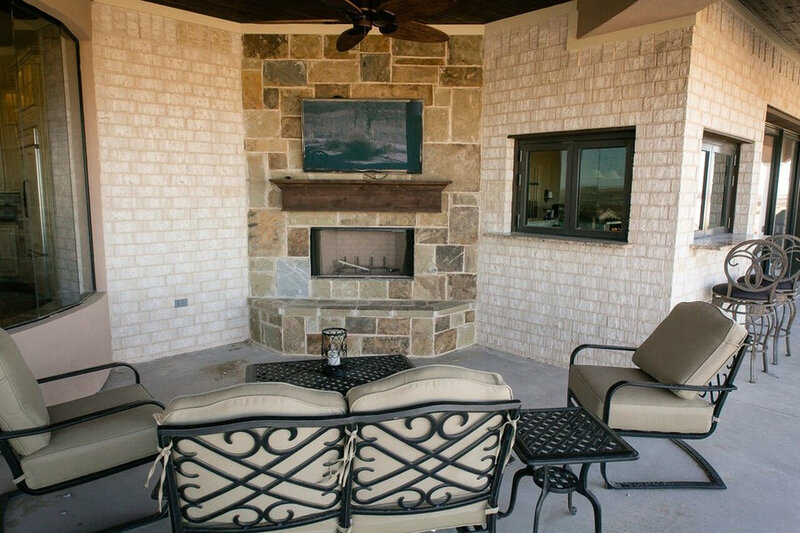 Continuing the great entertaining space, this outdoor fireplace and bar area is located just off the kitchen and billiards room. 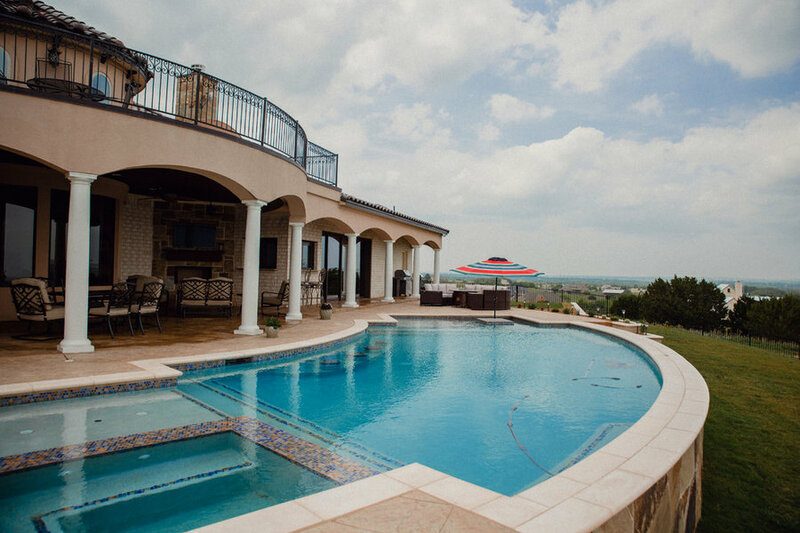 Wendy created a curved open second story balcony overlooking the pool below. 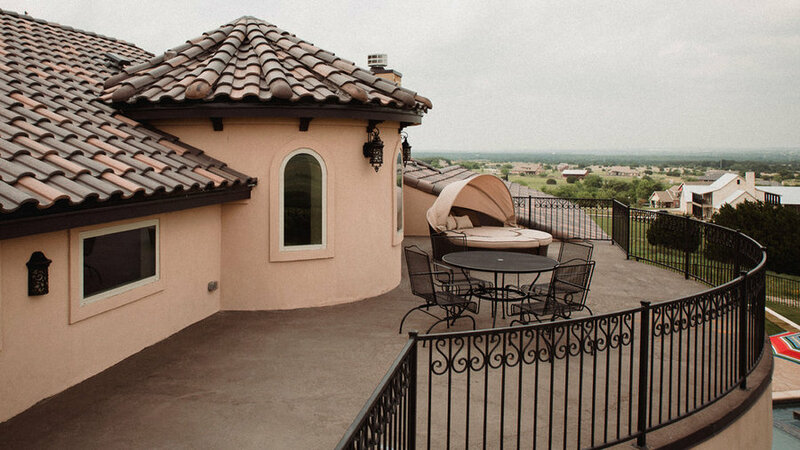 This dual purpose balcony gives great access to the valley view, and also provides shad and cover for the outdoor living spaces. View of the rear elevation of the home. 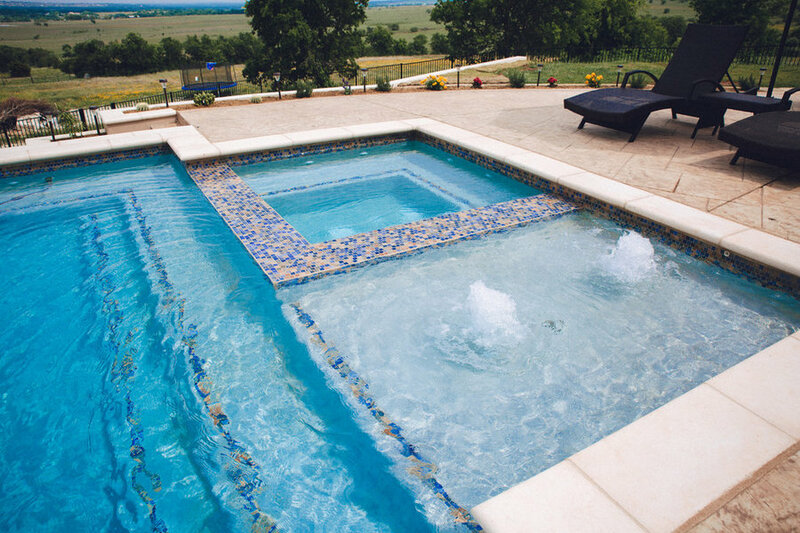 Pool detail with bubblers and hot tub area. Our clients created the best sleepover spot ever for their lucky kids! 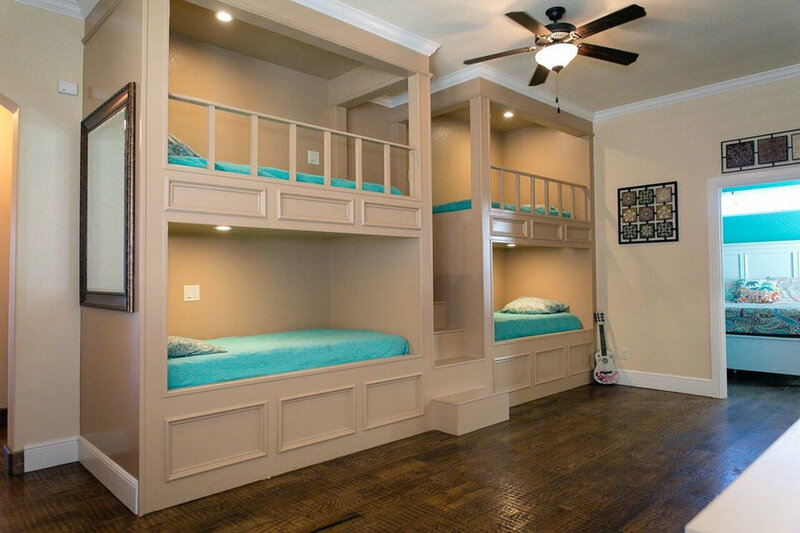 This custom built-in bunk bed quad features individual lighting and electrical outlets for devices. 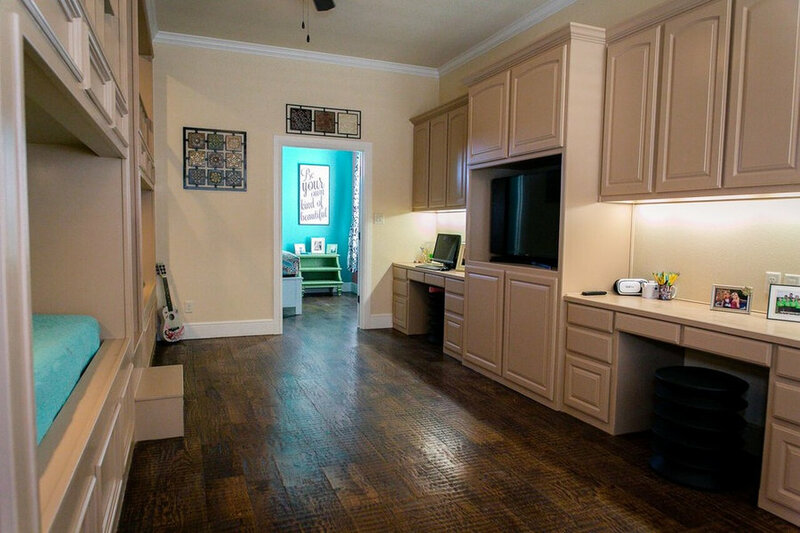 Directly across from the bed wall, a large built in entertainment center, storage cabinets and homework desks help keep the room clutter free and organized. 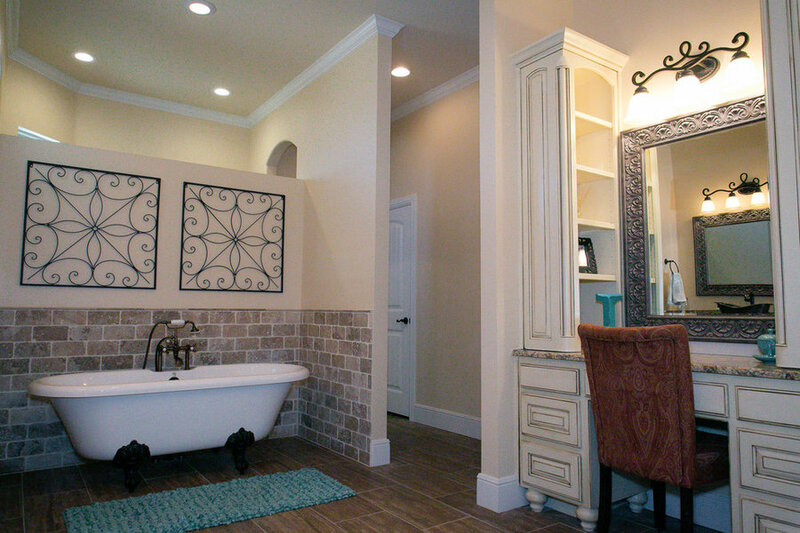 This lovely master bath is a true retreat, filled with natural light. 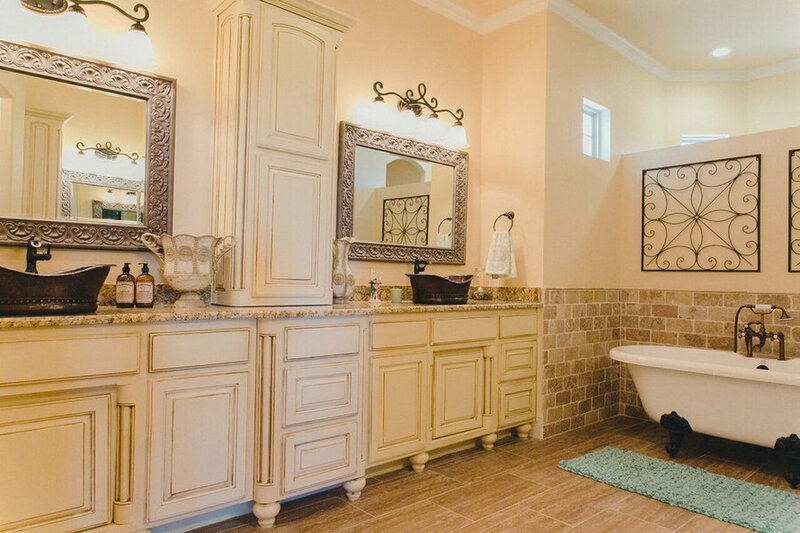 Featuring distressed cabinets, old world copper vessel sinks, an antique style claw foot soaker tub, and luxury walk in shower, this space provides the perfect respite from the world. View to the shower access... Walk behind the tub to get to the shower and water closet area. On the right our client enjoys a dedicated vanity with lots of space for storage and display. 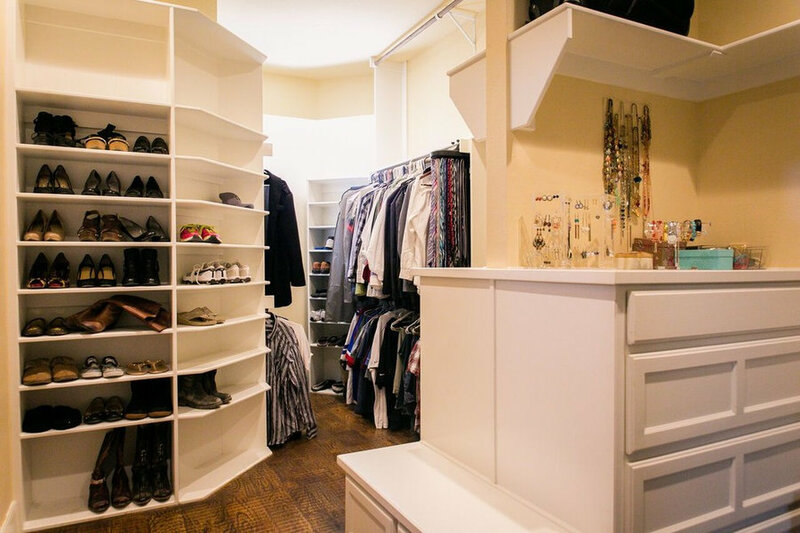 This dream his and hers master closet provides storage for everything, with perfect lighting and access. Note the three tier clothes racks, built in dressers, built in storage bench, built in wrap around shoe storage, built in rotating tie rack, and closet jewelry storage. This unique angled laundry room is conveniently located right off the master closet. It's also accessible from the hall. 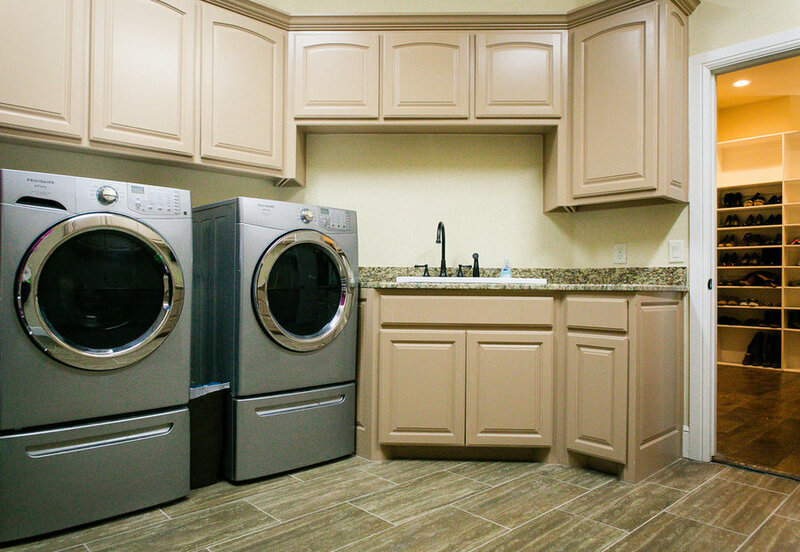 The cabinets are custom designed to surround the platform washer and dryer.